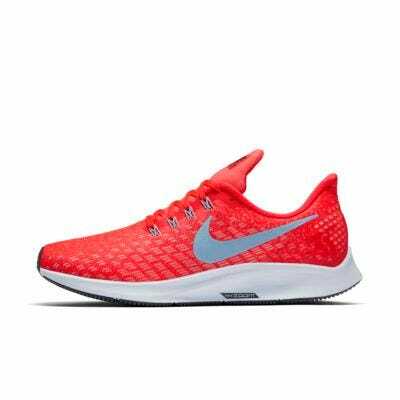 Yesterday, Nike announced the latest iteration of its all-time best-selling running shoe, the Air Zoom Pegasus. In the 35 years since the shoe has been around, the style and design of the shoe's upper has changed a lot, but the technology in the sole has remained pretty much the same. The Air Zoom Pegasus sole is made from a combination of foam and small airbags that provide extra cushion and spring. And for this latest update, Nike merged the airbags, so that its contoured to fit the shape of your foot, from your heel all the way to your toe, explains Chris Nuelle, a Nike EKIN expert, at a launch event for the shoe. And the other exciting feature? The Pegasus 35 has a women's-specific fit. Hearing that a running shoe is made "for women" may give you Lady Doritos vibes, but men and women do have slightly different feet. For example, men typically have longer and wider feet than women, and women tend to have narrower heels and higher arches compared to men. One very small study showed that women who run 50 miles a week or more tend to have higher arches and narrower heels than non-runners, although it's unclear why. These slight anatomical differences matter when it comes to running shoes, so it's not shocking that running brands make women's shoes differently. Back in 2004, Nike made the Pegasus' saddle (the part that hugs your arch) more "curvaceous," so that it could provide more support for women's feet. For the Pegasus 35, Nike surveyed women runners about what else they want from a shoe, and found that weight and cushion were super important. So, this new model is made with a slightly softer foam, which makes the whole shoe lighter (a women's size 8 is about 8.1 ounces, which is slightly heavier than the Nike Epic React). Another difference that you'll notice with this Pegasus 35 is the shape. The heel is designed to bend away from your Achilles tendon, to alleviate some of the pressure that you may feel. The heel is also beveled slightly at the sole, so it "looks as fast as it feels," Nuelle says. And, the knit fabric of the shoes upper is made with a special textile that makes the color look extra vibrant on your foot, he says. In other words, you could totally wear these when you're not working out. I wore the Pegasus 35 on a three-mile run through lower Manhattan, and definitely noticed the raised arch. I usually require a lot of arch support from a running shoe, but felt like these hugged my foot nicely. The Pegasus 35 is lightweight yet supportive, and are pretty responsive. According to Nuelle, the lugs (the grooves in the sole) are shorter and smaller at the front of the shoe, which is what provides the "snappy feel off the toe." I also wore them on the treadmill, and liked how springy they felt. Overall, the Nike Pegasus 35 is a solid choice for a running shoe, especially if you're someone who typically likes a lot of arch support and cushion. And while they are technically "for women," Jes Woods, the Nike+ Run Club coach who led the three-mile run, told us that she knows men who buy women's shoes and vice versa.